rearrangement reactions occuring during GC/MS measurements. This document provides a basic overview of the FFC program. It contains both a user manual for the program as well as a step- by-step tutorial using sample data available on the website. Electron impact ionization mass spectrometry measurements lead to complex mass spectra, caused by the partial fragmentation of the analyzed compound. For the calculation of mass isotopomer distributions (MIDs) from stable isotope labeling experiments, the chemical formula of the specific fragment ion must be known. However, the process of assigning a structural formula to a fragment ion from a known molecular ion structure is difficult. FFC is a Qt4 based software package that implements an novel algorithm for the calculation of chemical formulas for fragment ions where the structure of the molecular ion is known. This algorithm is speci cally designed for MS data with nominal masses (such as from quadrapole instruments), and is based on combinatorics, thus requiring no a priori knowledge of fragmentation mechanisms. The combinatorial approach also allows this algorithm to be universally applied for the calculation of chemical formulas, providing a distinct advantage over rule-based approaches. FFC is freely available under an open-source license, and can be used on both Windows and Linux operating systems. where filename is the name of the deb or rpm file (e.g ffc-1.0-Linux.deb). Start the windows installer and follow the instructions. The graphical user interface (Figure 1) is organized in one main window containing three subwindows. This window (in the upper part of the main interface) displays the loaded spectrum. The x-axis is m/z values, and the y-axis is the intensity. By clicking a dragging the mouse, you can zoom in on specific parts of the spectrum. To zoom out, right click on the window. 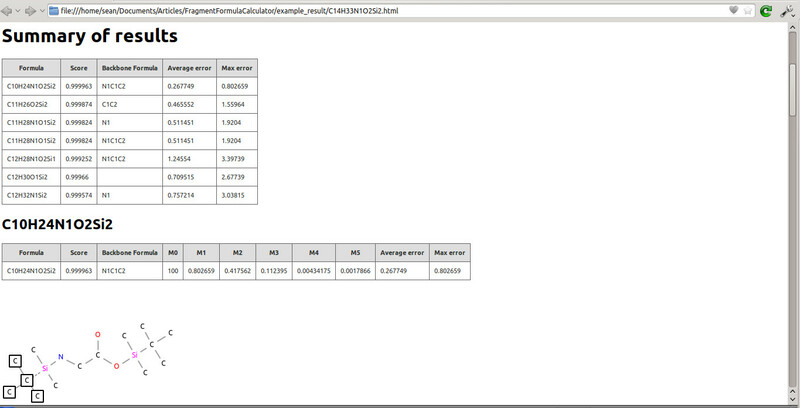 This window (in the bottom left of the main interface) contains the compound of interest for fragment calculation. In the 'Compound Info' tab, you can search for a compound by either name or formula, as long as a library has been chosen in the settings. If a spectrum has been loaded (either by searching a database or by importing), here the user can choose the compound fragment to calculate the formula for. After calculation of the formula, the 'Result' tab contains the calculated formulas for the compound of interest at the corresponding sized fragment. NOTE: If a mol file and a spectrum have been imported by the user, there is no need to fill in the fields here. The formula for a desired fragment can calculated anyways. 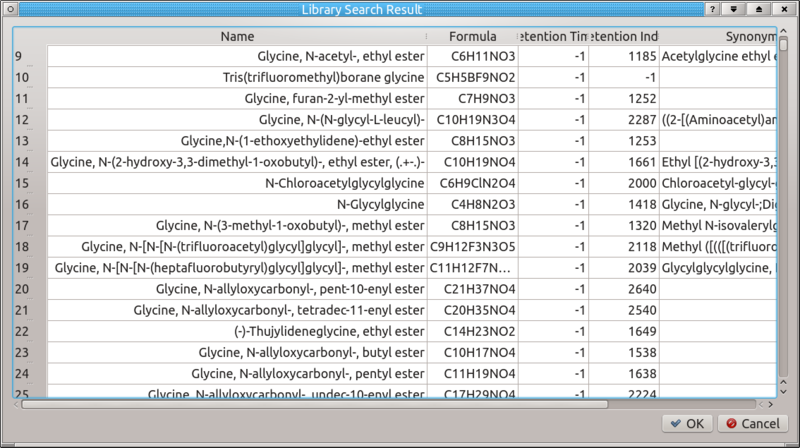 This window (in the bottom right of the main interface) displays the chemical structure of the compound of interest. The settings can be reached by either clicking on the icon or by choosing 'Settings' from the 'Tools' menu. Library - Sets the active library for use with the program. 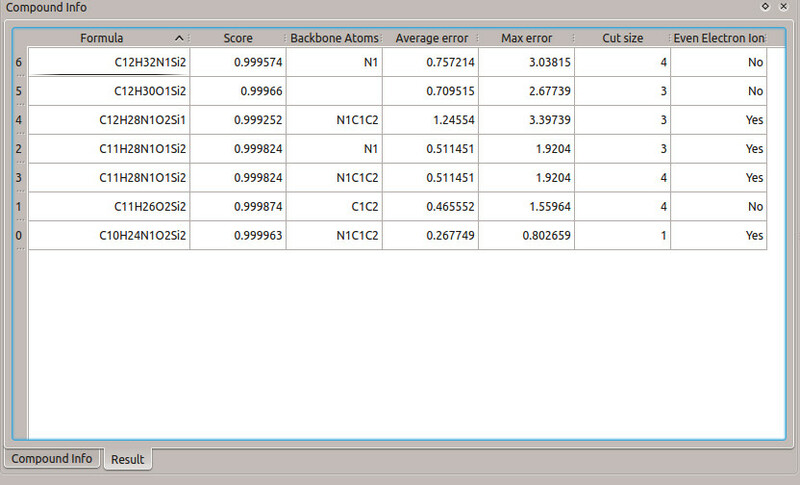 Max Cut Size - Sets the maximum cut size the algorithm will use to calculate possible formulas for fragment ions. Click this button (or select 'Import spectrum' from the 'File' menu) to import a mass spectrum .csv file. Click this button (or select 'Import mol file' from the 'File' menu) to import a structural .mol file. NOTE: A spectrum and a MOL file must be imported in order to calculate the fragment formulas. To convert a library into an SQL database for use with FFC, first click either the or select 'Import Library to SQL' from the 'Tools' menu. Then select the sdf file that you want to convert. Finally, choose an output directory where the SQL database will be saved. The sdf file will be automatically converted to an SQL database, and a prompt will pop up when the conversion is finished with the number of elements successfully converted. An example entry for a compound in an sdf file is given on the website. NOTE: Once the conversion is finished, the library needs to be set as the active library in the 'Settings' window before it can be queried! Once a library has been loaded, a compound can be found from the library by its name or molecular formula. Enter either of these into the corresponding fields, make sure the correct radio button is selected, then press ('Start Library Search'). A result table will appear with a list of matches. Select the desired compound and then press OK to load the corresponding structure and spectrum for further fragment formula calculation. For derivatized compounds, to select the atoms belonging to the backbone of the original compound, click the icon in the main window toolbar (or choose 'Select Backbone Atoms' from the 'Tools' menu). A window with the visualized compound will appear. Click on the atoms which belong to the backbone; a bold box will appear around selected atoms. Selected atoms can be clicked again to deselect them. When all desired backbone atoms have been selected, press OK to return. 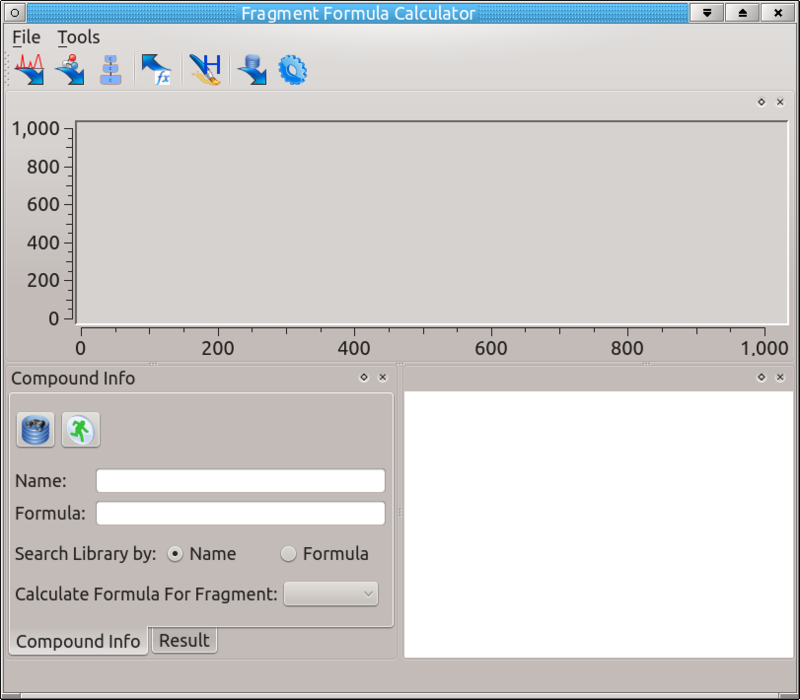 Once the compound has been selected, the list of fragments for which it is possible to calculate the formula will be automatically generated. Choose the desired fragment in the pull down list 'Calculate Formula for Fragment', and press the 'Start Calculation' (or select it from the 'File' menu; Shortcut CTRL+R). 'Calculation Finished' will appear at the bottom information bar when the algorithm has finished calculating the formulas. Once the formula calculation is finished, the 'Compound Info' window will automatically switch to the 'Results' tab to show the results. 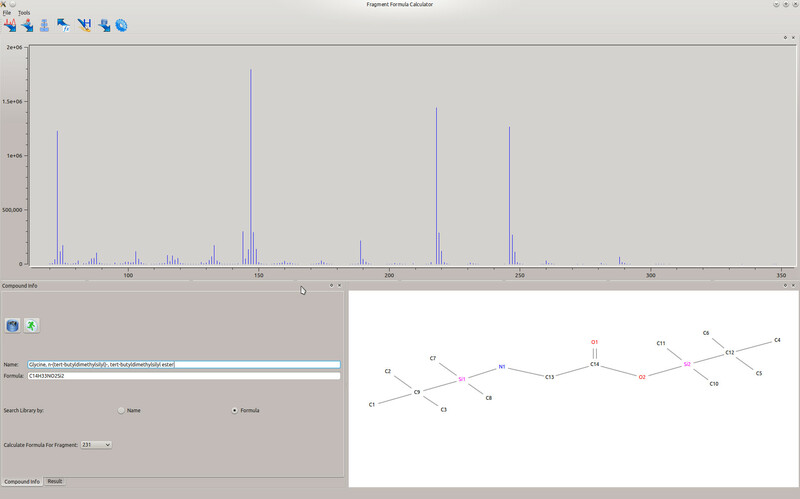 When a calculated formula is clicked, the visualization window changes to show a pseudostructure of the fragment ion. Dashed lines represent calculated bonds broken, and boxes appear around the atoms that are lost in the fragment. Click this button (or select 'Generate Fragment Report' from the 'Tools' menu) to export the results table (with corresponding structural gures) to an HTML file. The output le contains a summary of results (as listed in the 'Results' tab); for each result, the corresponding psuedostructure with broken bonds and lost atoms is shown. An example is shown in figure 2. Figure 2: Example of an exported fragment report. Only the first page is shown, including the summary of results, and one possible fragment pseudostructure. In this tutorial we will import a mol file and a spectrum le for TBDMS-derivatized glycine (N,O-bis-(trimethylsilyl)-glycine), using FFC to calculate the proper fragment for m/z 246 in the mass spectrum. To get started, download the dataset (ffc_sample_data.zip) from the FFC Website, unpack it, start FFC and follow the steps below. FFC can be started by selecting All applications -> Education -> Science -> FFC (KDE) or by typing ffc-app on the command line. On Windows select FFC from the Start menu. You will see the main window of FFC when the program starts. To import the spectrum, click the icon and browse to the folder containing the downloaded data. Choose 'glycineTBDMS.csv' to load the spectrum. After it loads, you will see the spectrum in the 'spectrum' window (as in Figure 3). Figure 3: Imported spectrum for TBDMS-derivatized glycine. To import the mol file, click the icon and browse to the folder containing the downloaded data. Choose 'glycine.mol' to load the mol file. After it loads, you will see the structure of N,O-bis-(trimethylsilyl)-glycine in the 'Result Visualization' window (as in Figure 4). Figure 4: Structure of TBDMS-derivatized glycine from the sample mol file. The backbone atoms of the original compound must be selected before calculating fragment formulas, so that the algorithm can differentiate between which atoms come from the compound of interest and which atoms come from the derivatization. 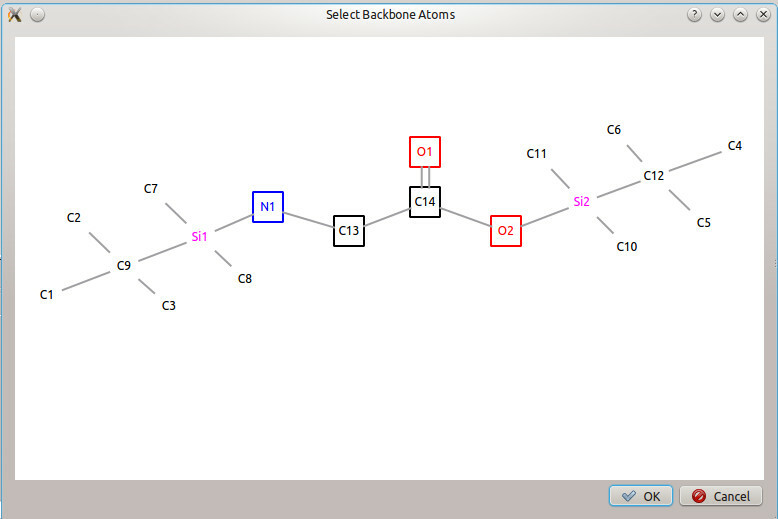 Click on to open the 'Select Backbone Atoms' dialog window, and choose the backbone atoms from glycine (as shown in Figure 5). Click the OK to confirm the selection. The structure in the 'Result Visualization' window will change, and only the backbone atoms will have associated numbers. Figure 5: Selection of backbone atoms from the original glycine compound. Figure 6: Results table from the calculation of fragment 246 of TBDMS-derivatized glycine. The correct formula for this fragment is C10H24O2NSi2, and this result also is present in the table. It has the highest score, lowest number of broken bonds, and lowest error value. The structure of the fragment can be seen in figure 7. 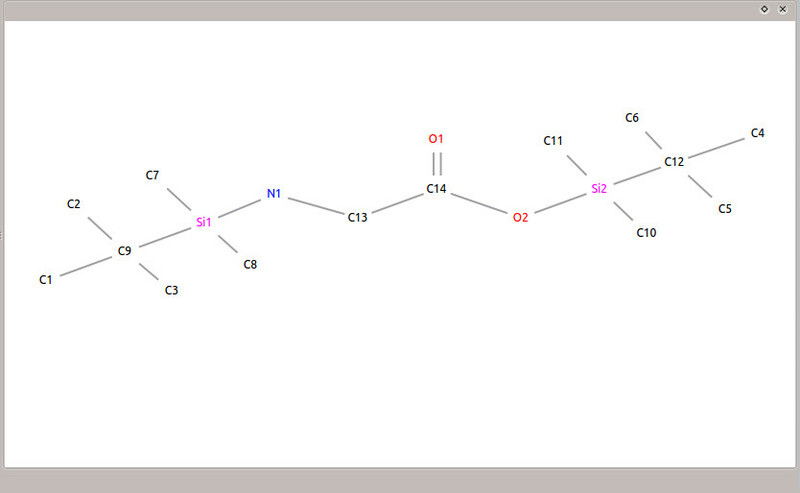 The single cut results in four carbons from the TBDMS being lost, while the entire backbone of the glycine remains intact. Figure 7: Structure of the correct fragment for TBDMS-derivatized glycine at m/z 246. It is interesting to note that the result is maintained for different backbone atoms chosen. If the main concern is the carbon backbone (without the nitrogen), then the list of results is different than when only the nitrogen backbone is chosen (Figure 8). However, in both of the resulting lists, the correct fragment formula is still the best choice (due to the score, cut size, and error). Figure 8: Results table from calculation with different backbone atoms. (a) Only carbon atoms of the glycine molecule are chosen as the backbone. (b) Only the nitrogen atom of the glycine molecule is chosen as the backbone. To export the results, click on the icon. A dialog window will pop up, and you can choose a directory to export the results into. The results are exported in HTML format, with the corresponding structural diagram above each fragment result.